After an initial decline in yields during the first few years of transition, the organic system soon rebounded to match or surpass the conventional system. Over time, FST became a comparison between the long term potential of the two systems. 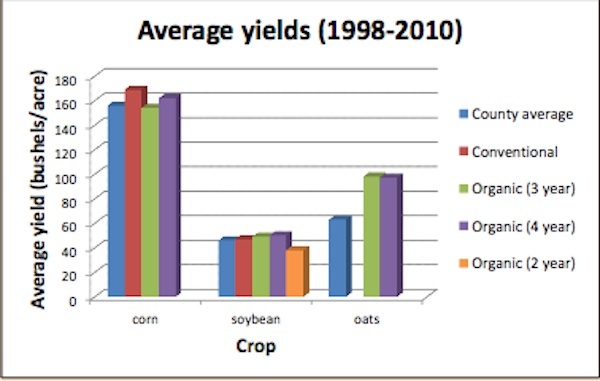 Organic yields match conventional yields. And now comes evidence from the very heart of Big Ag: rural Iowa, where Iowa State University's Leopold Center for Sustainable Agriculture runs the Long-Term Agroecological Research Experiment (LTAR), which began in 1998, which has just released its latest results. That's ridiculous. This shouldn't even be a debate. Even if you could use all the organic material that you have—the animal manures, the human waste, the plant residues—and get them back on the soil, you couldn't feed more than 4 billion people. In addition, if all agriculture were organic, you would have to increase cropland area dramatically, spreading out into marginal areas and cutting down millions of acres of forests. And pesticiders have parrotted those same arguments all along. Yet Norman Borlaug was wrong, and so are they. In short, Borlaug's claim of huge yield advantages for the chemical-intensive agriculture he championed just don't pan out in the field. Organic crops draw a higher price in the market and don't require expenditures for pricy inputs like synthetic fertilizer and pesticides. Sure, it's a bit more complicated to plow up weeds and plant cover crops than to just spray everything and hope you can stay ahead of the mutant weeds you're creating. But if you like health and profit more than the great god efficiency, you'll go organic and you'll never go back. 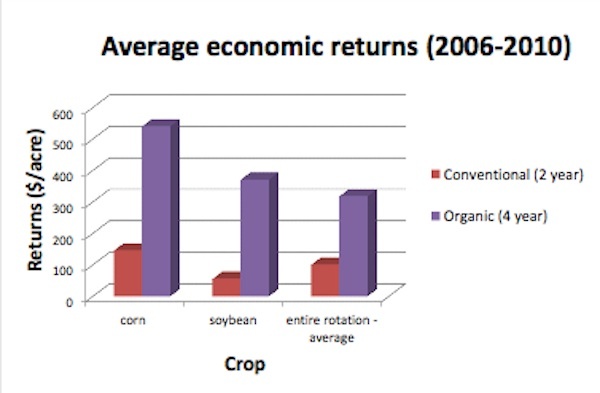 Organic outperforms conventional in years of drought. Organic farming systems build rather than deplete soil organic matter, making it a more sustainable system. Organic farming uses 45% less energy and is more efficient. Conventional systems produce 40% more greenhouse gases. Organic farming systems are more profitable than conventional. All that and you don't get pesticides in your food. For health and profit, grow organic, and buy organic.